These Italian Stuffed Shells are the ultimate creamy, cheesy baked pasta dish. 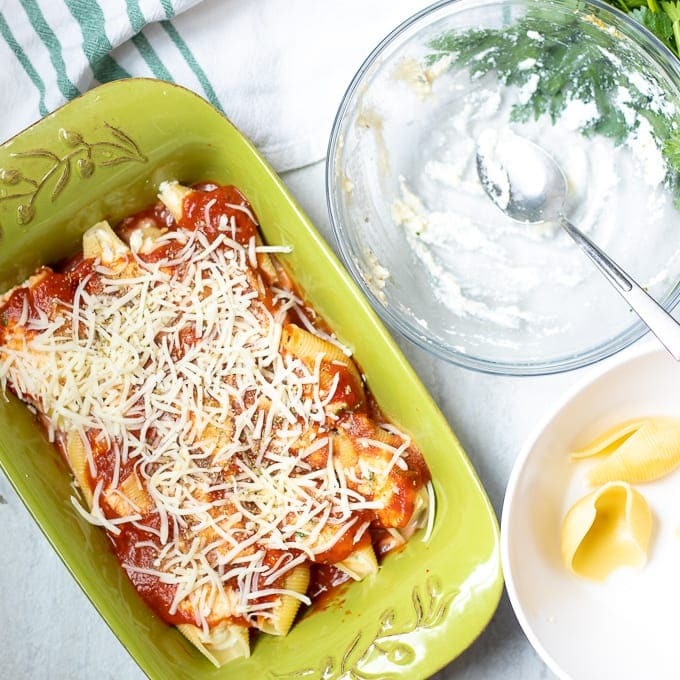 If you dig comforting, cheesy pasta, you must also check out Easy Baked Rotini, Baked Ravioli Lasagna, Instant Pot Lasagna, and Easy Homemade Lasagna for more satisfying pasta recipes. May I also suggest serving these Baked Shells with Homemade Garlic Toast and a Greek Salad. One of my favorite things in the world to eat is Ravioli. But I do not like to make homemade ravioli–I just do NOT have the time most days. However, Italian Stuffed Shells have the same great flavor as ravioli with just a fraction of the work. Tender jumbo pasta shells are stuffed with a creamy ricotta filling and then baked in marinara for the ultimate comfort food. These Italian Baked Shells seriously make my soul happy! Yes, food can do that for me–especially when it is pasta smothered in my homemade tomato sauce and cheese! But seriously, stuffed shells is a classic recipe that everyone tends to enjoy. And this baked pasta is really not that hard to make at home. Bring a large pot of water to a rapid boil. Boil jumbo shells for 9 minutes. 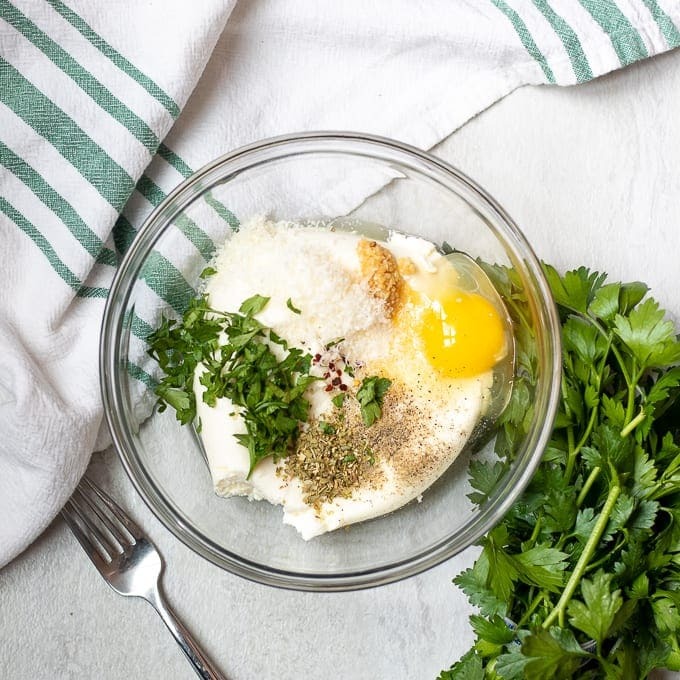 In a large mix bowl, mix together ricotta with egg, Parmesan, parsley, and seasonings. Spread out 1/2 cup tomato sauce on bottom of casserole dish. Stuff each shell with the ricotta mixture, about 1/4 cup filling per shell. Place the stuffed shells in the baking pan, nestling them close together. Cover with additional sauce and top with shredded mozzarella cheese. Bake at 375 degrees until filling is baked through and cheese is melted and browned. I love to double this recipe and freeze half for busy day! To freeze stuffed shells, use a freezer safe casserole pan or disposable tin pan. Prepare shells up to baking as recipe states. Cover with aluminum foil and freeze for up to 3 months. To reheat frozen stuffed shells, bake from frozen, covered at 350 degrees for 1 hour. Remove foil and bake for an additional 10-15 minutes until the cheese is melted and the shells are warmed through. A lot of people love to add spinach to the ricotta filling of these stuffed shells. I personally do, but my picky kids do NOT! To add spinach, simply defrost 1/2 to 2/3 cup of frozen chopped spinach. Wring out all excess moisture from spinach using a clean kitchen towel or cheesecloth. Mix the spinach into the ricotta filling and stuff the shells as recipe directs. It is also delicious to add in ground beef or sausage to the cheesy filling of these stuffed shells. To make stuffed shells with meat, simply brown 1/2 pound ground beef or sausage until cooked through. Drain off excess grease and crumble up meat into bite size pieces. Add to ricotta mixture. You can also just add the ground beef to the tomato sauce and serve these Cheesy Stuffed Shells with meat sauce. Feel free to use 1 teaspoon dried parsley in place of the fresh parsley in the ricotta filling. If you do not like spice, omit the red pepper flakes. I love to use my homemade tomato sauce for this recipe, but any good quality marinara or spaghetti sauce work. Preheat oven to 375 degrees and bring a large pot of water to a boil. Once the water comes to a boil, heavily salt the water and add in the shells. Cook for 9 minutes and then drain. In a large bowl, mix together the ricotta, egg, Parmesan, garlic, parsley, red pepper flakes, oregano, salt and pepper. In a 2-quart baking dish, spread ½ cup marinara sauce on bottom of pan. Spoon the ricotta mixture into the cooked shells and place into prepared baking dish. Top with the remaining marinara sauce. Sprinkle with the Mozzarella cheese. Bake for 30 minutes, or until cheese is melted and browned. Thanks so much for being a part of A Mind Full Mom! I doubled the recipe and made one for my family and one for friends who just welcomed a new little one. These stuffed shells were a hit all around! I love hearing that!! So glad you all enjoyed! Such a great recipe! Stuffed shells are a family favorite for sure! YAY!! Love that you family enjoyed.